4to., red cloth lettered in black, various pagination, most issues run 32pp. Fine. This magazine ceased publication with vol. 3 no. 14, June 1924 so it appears that this bound volume is lacking nos. 11, 12, 13, & 14. Bracebridge: D.E. Bastede, Printer and Publisher,	1897. Tall 8vo., orig. stitched wrappers, (12)pp. Near fine. Prominent People of the Maritime Provinces. St. John, NB: J. & A. McMillan,	1922. Tall 8vo., orig. publishers fabricoid/leatherette, 215pp. double columns. Near fine. Report Of The Board of Trustees of the Public Archives of Nova Scotia For the Year ending 30 November, 1945. Tall 8vo., orig. printed wrappers, 48pp. Some spotting on wrappers o/w near fine. The Alberta Field Force of '85. Battleford: Canadian Northwest Historical Society Publications, Vol. I, No. VII,	1931. The Canadian Handbook and Tourist's Guide Giving A Description of Canadian Lake and River Scenery and Places of Historical Interest. With The Best Spots for Fishing and Shooting. Montreal: Published by M. Longmoore & Co.,	1867. Second edition. Square 8vo., orig. cloth, 196, (20)pp.ads. Name, lacking the front free e/paper, head of spine chipped away, holes in the front spine gutter, a good copy. London: J.M. Dent,	nd. (1914)	First edition. Tall 8vo., orig. cloth backed boards, 291pp. Fine. Social Credit Manual Social Credit as applied to the Province of Alberta. NP: (Calgary): no publisher,	(1935). Sm.8vo., orig. printed wrappers, 64pp. Cheap paper browned o/w fine. London: Henry S. King & Co.,	1873. First edition. Tall 8vo., orig. green cloth with elaborate gilt and black stamped decoration on upper cover and spine, brown e/papers, xvi, 333, 32pp.ads. Inner hinges cracked, some wear o/w very good. London: Henry S. King & Co.,	1873. First edition, binding variant. Tall 8vo., orig. green cloth (darker that usual) with decoration in black on upper cover, blind on rear, with elaborate gilt decoration on the spine, yellow e/papers, xvi, 333pp. Inner hinges cracked, some light wear o/w very good. The lack of gilt decoration on the upper cover would seem to indicate a later binding but for the curious fact that the elaborate gilt stamped design on the spine is quite different from the other pattern we have seen, as is the decoration on the upper cover. Not what one would usually expect from an attempt to sell off unsold sheets in a cheaper binding. A curious example of a 19th century binding mystery. Glace Bay: No publisher,	1940. First edition. 8vo., cloth backed wrappers, 44pp. Cheap paper a bit browned o/w a nice copy. Camera Studies of Ottawa 1937 from the Ottawa Journal. (Ottawa: The Journal	December 1937). 4to., orig. printed wrappers, (40)pp. mostly illustrations. Near fine. Emigration. 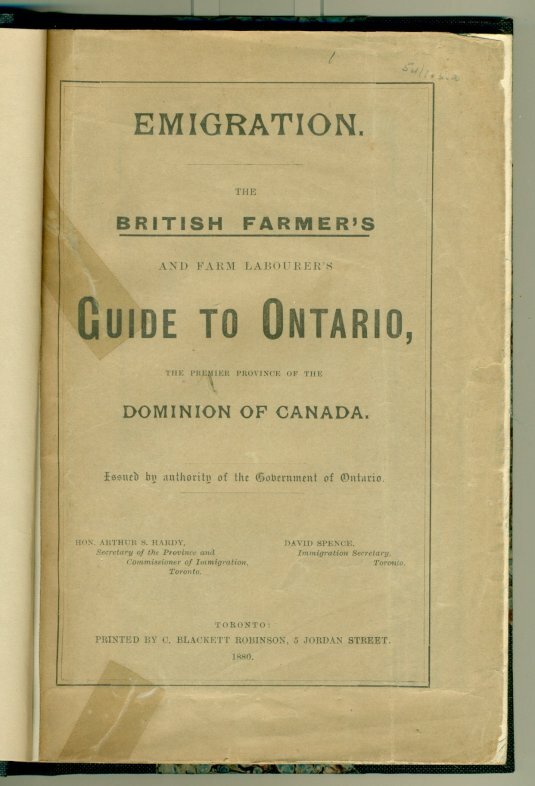 The British Farmer's And Farm Labourer's Guide To Ontario, The Premier Province Of The Dominion Of Canada. Issued by authority of the Government of Ontario. Toronto: Printed by C. Blackett Robinson, 1880. First edition. Tall 8vo., recently rebound in blue half cloth, marble boards, 108pp. With upper wrapper bound in. Tall 8vo., flexible leather, 44pp. Rubber stamps o/w very good. International Espionage Behind Edward's Abdication By Observer (pseud). Narrow 8vo., orig. wrappers, 35pp. Fine. Memorandum on Cholera, Adopted at a Medical Conference Held in the Bureau of Agriculture, March, 1866. (Ottawa): Printed for the Bureau of Agriculture,	1866. First edition. 8vo., lacking wrappers, (36)pp. This copy is lacking the wrappers o/w a nice copy of a scarce item. Memorials of Acadia College and Horton Academy For the Half-Century 1828-1878. Montreal: Dawson Brothers,	1881. First edition. 8vo., orig. green cloth, 260pp. Inner front hinge cracked o/w a fine copy. The Canadian Lawyer: A Handy Book of the Laws, For the Use of Merchants, Farmers and Mechanics. 8vo., orig. beige cloth stamped in black, 352pp. Name rubberstamped on titlepage and table of contents, name written in ink on upper cover but o/w a near fine copy. The Dominion of Canada With Newfoundland and An Excursion to Alaska HandBook for Travellers. Leipzig: Karl Baedeker,	1907. Third Revised and Augmented edition. Sm.8vo., orig. red cloth, lxiv, 331pp. Fine.